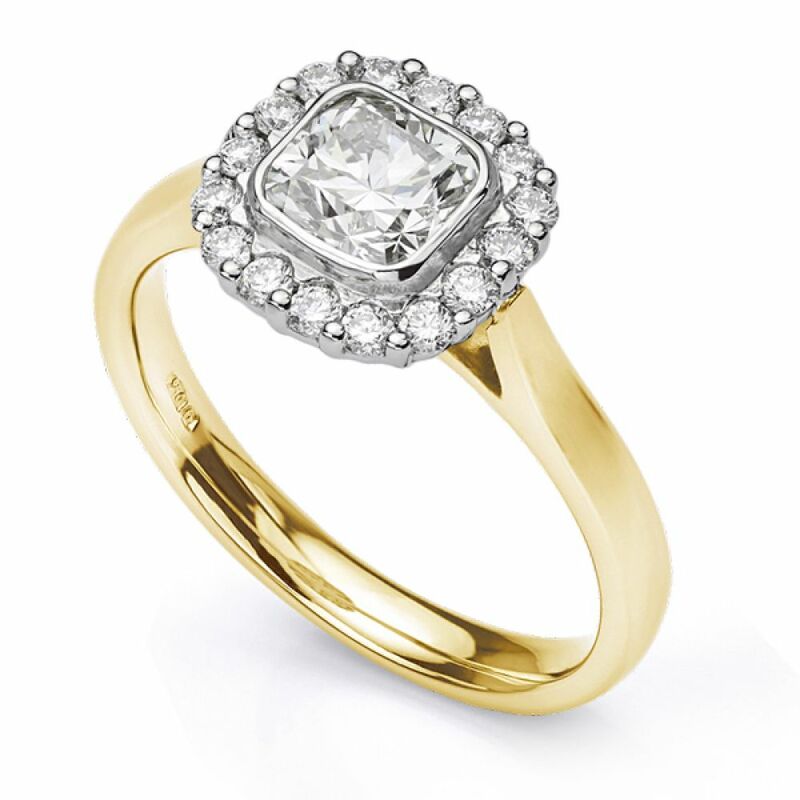 Discover the Eclipse diamond engagement ring. Crafted with a choice of Cushion cut diamond, this unique halo engagement ring features an incredible Cushion cut diamond surrounded by a halo of brilliant diamonds and benefits from a wedding ring friendly setting in a wide choice of precious metals. Eclipse sparkles with incredible fire from the Cushion cut Diamond sparkling at the heart of this elegant Engagement Ring design. Decide on your perfect combination of Diamond colour, clarity and carat weight in a range of precious metal choices. We will craft your ring individually over 3-4 weeks—creating the perfect halo Engagement Ring. This unique ring design boasts an additional 0.30 carats of Round Brilliant cut Diamonds in addition to the certified central Diamond. Styled with a court profile, enjoy comfort from a 2.5mm wide band—matching to our Arreton plain wedding ring design. Showing the Eclipse design set with a 0.70cts Cushion cut diamond. 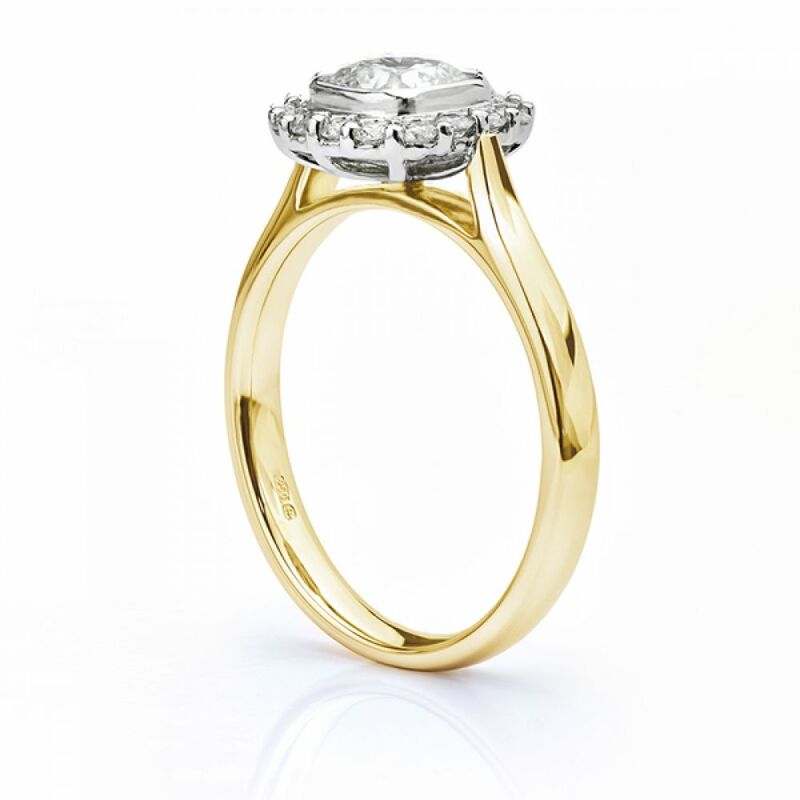 In addition to 950 Platinum, 950 Palladium and 18ct Gold, we offer the additional choice of 18ct Fairtrade Gold giving the assurance of 100% ethical standards. Once completed, your ring will be presented within a Serendipity Diamonds presentation box. We offer free Worldwide shipping in addition to click and collect from our Ryde showroom. The Eclipse diamond engagement ring, 0.70cts centre diamond, shown within its presentation box.